Regents Steve Ludwig (left) and Kyle Hybl accept their honors as Regent Emeritus during their final Board of Regents meeting Nov. 9. 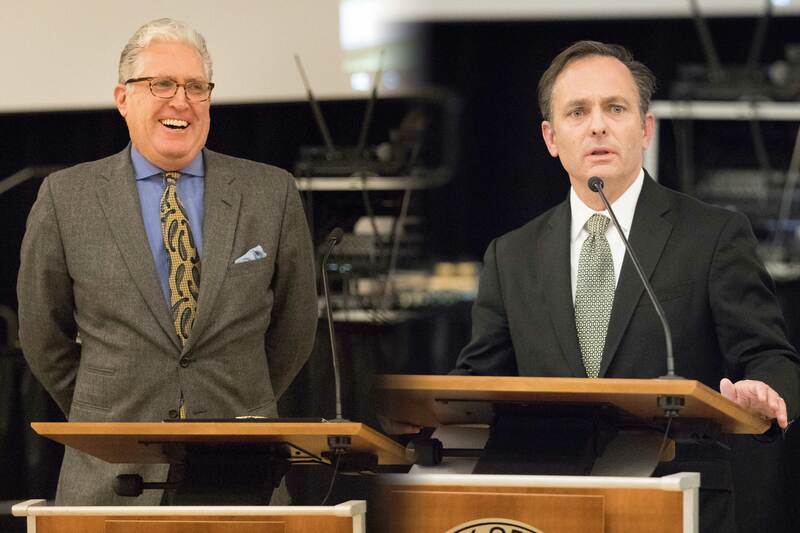 With 24 years of combined experience, the CU Board of Regents recognized Steve Ludwig and Kyle Hybl for their service to the university with the designation of Regent emeritus status at the conclusion of their final Board of Regents meeting Nov. 9 in Berger Hall. The two are term-limited after 12 years on the board. “We deeply appreciate the leadership impact Regents Hybl and Ludwig have had on our campus resulting in transformational changes in areas such as campus infrastructure, fully online programs, and cybersecurity among others,” said Chancellor Venkat Reddy. Hybl represented the Fifth Congressional District for his two terms, which includes the UCCS campus. He was the chair of the board for four one-year terms, the most of any regent, and served as chair for the audit, budget and finance, and academic affairs committees. Hybl was instrumental in multiple projects that supported UCCS, like the City for Champions initiative that included funding for the William J. Hybl Sports Medicine and Performance, the National Cybersecurity Center and the Ent Center for the Arts. Hybl also supported multiple community initiatives that supported CU, like the UCHealth/Children’s Hospital lease agreement with Colorado Springs, and the development of the Colorado Springs Branch Medical Campus with Anschutz Medical Campus. He is a CU Law School graduate and led the board to the adoption of the mission statement, guiding principles and vision for the system. Hybl was named chairman emeritus for his leadership as a four-time chair of the board and was presented the award by current chair Sue Sharkey. Ludwig served two terms in the at-large position for the board, and as a UCCS philosophy alumnus and former student body co-executive, is the only UCCS graduate to serve on the Board of Regents. He was vice chair of board in 2010 and served as chair of the audit, laws and policies, budget and finances, academic affairs and strategic planning committees during his 12 years. Ludwig was instrumental in the development of CU Guaranteed, which provides guaranteed admission for community college transfer students, and the first cross-campus, three-year, online-only degree. He secured unanimous board support for a $22 million online investment package for new technology to facility online growth, expansion of offerings for high school concurrent enrollment and an all-inclusive $15,000 bachelor’s and master’s degree that will expand student access, increase affordability and encourage campus innovation. Ludwig was named vice chair emeritus for his term as vice chair of the board and was presented the honor by current vice chair Jack Kroll. Chance Hill of Colorado Springs will assume Hybl’s position on the board while Lesley Smith of Boulder will take Ludwig’s position. The Board of Regents are elected officials charged with the general supervision of the University of Colorado and maintain exclusive control and direction of all funds and appropriations to the university. There are seven Regents elected from each of Colorado’s congressional districts and two elected from the state at-large. Can you explain what the pay and benefits are for someone in “emeritus” status?